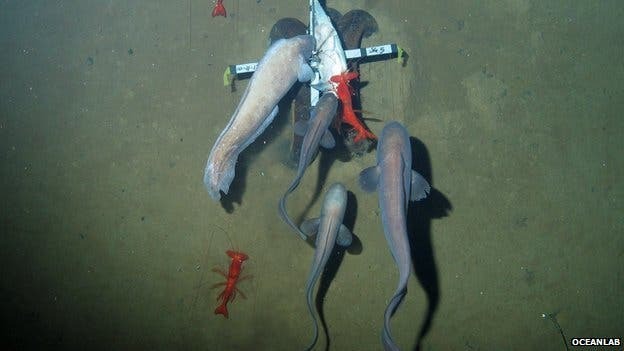 For the first time, researchers have taken a look at the life that thrives in one of the deepest spots in the ocean. They investigated the New Hebrides trench, located just West of Vanuatu, and revealed that cusk eels and crustaceans teem more than 7,000m (23,000ft) down. They used cameras fitted on an unmanned lander to film the deep-sea creatures. The fact that this is happening at a depth of 7 kilometers simply blows my mind. 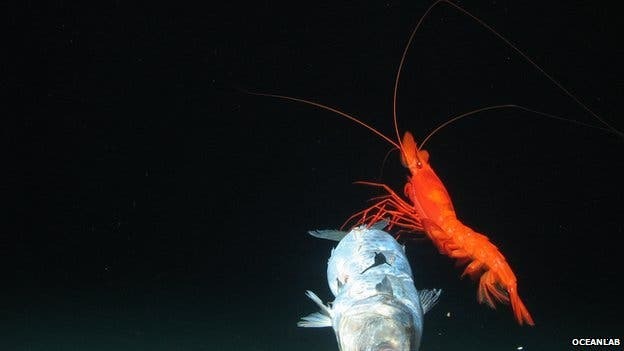 Marine biologists were surprised to see that life in this trench significantly differed from other regions of the deep that had been studied – painting a good picture of just how spectacular and interesting this extreme biodiversity really is. “We’re starting to find out that what happens at one trench doesn’t necessarily represent what happens in all the trenches,” said Dr Alan Jamieson, from Oceanlab at the University of Aberdeen, UK, who carried out the expedition with the National Institute of Water and Atmospheric Research in New Zealand. The 30 day expedition was largely successful showing large, grey cusk eels up to 1 meter long, chopping on the bait, as well as large, bright red prawns scrabbling around on the sandy seabed which reaches 7.200 meters in its deepest point. They also spotted eel pouts, arrow-tooth eels and thousands of smaller crustaceans – some of which were unfortunate enough to be captured and taken back to the surface. There are over 30 deep trenches across the world, most of them in the Pacific Ocean, due to its very intense tectonics. Until this expedition, the New Hebrides Trench (which is also some 1.500 km away from New Zealand) has been relatively unstudied – from a biological point of view. When compared to other, apparently similar areas, the differences are major. “The surprising thing was that there was a complete and utter lack of one of the most common deep sea fish we would expect to see. Anywhere else around the Pacific Rim, around the trenches we’ve looked at, you see a lot of grenadiers – they are quite a conspicuous part of the deep-sea community. But when we went to the New Hebrides trench, we didn’t see a single one. They also reported a rather surprising absence of a certain snailfish, a small pink fish commonly found throughout the world’s trenches. They believe the differences lie in the absence of a major nutrient source in the New Hebrides Trench. This expedition is part of a larger wave to explore the very depths of the planetary ocean, which can go even 11 km deep, in the Mariana Trench. Almost all of this has been carried out using landers or other unmanned vehicles, but in 2012 Hollywood movie director James Cameron made a record-breaking dive to the deepest place in the ocean – the Mariana trench. He described it as an alien place, devoid of life. This is the situation not so much because of the depth, but rather because it is so far from the continental shelf, which means that very few nutrients drift into it. However, researchers have shown that while it may be devoid of macroscopic life, microscopic life still thrives – even in this fantastically extreme environment.